I’m thrilled to share the news that my new ten-minute piece Sunday Surprise will receive its premiere production at A-Squared Theatre Workshop’s My Asian Mom 2014 Festival! This also marks the Chicago debut of my work, and I’m excited to be introduced to yet another theater community outside of NYC. The cast includes Samantha Garcia, Alexandra Gonzalez, Tea Ro, and Pearl Paramadilok, with direction by Jin Kim. Also, fun fact: this piece is actually an excerpt from the new play I’ve been developing with the Mission to (dit)Mars Propulsion Lab, so consider it a sneak peek! Hope to see you in Chicago! The most exciting news that’s come about in the last few months is that I’m going to have one of my plays published for the first time! Yes, that’s right, I will be a published playwright! 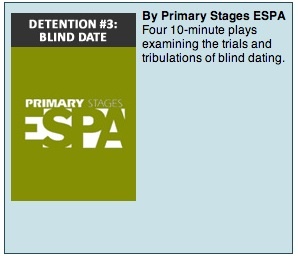 My ten-minute play, Ready, Aim…Fire!, written for and produced by ESPA at Primary Stages’ Detention Series, will be published along with all the other plays from the first 15 Detentions. I’m so thrilled to be included in such an amazingly talented roster of fellow ESPA playwrights! And I’m even more excited to share this fun little play with all the folks who didn’t get a chance to see it during Detention or Leviathan Lab’s Asian American Women Playwrights Short Play Festival back in 2011. And last but not least, I would be remiss if I didn’t give a quick update about the fantastic time I had in Minneapolis for the New Eyes Festival back in December. The folks at MU Performing Arts were so warm, welcoming and generous, and it was a wonderful experience! My fellow Leviathan Labbie playwright partner-in-crime, Marisa Marquez, also had her play Cyber Fishing read during the festival, and we had a blast painting the town brown that weekend (brown because we’re Filipina, see?). I had a great time just sitting back and watching the fabulous actors, Katie, Brandon and Allen, do their thing with my plays under the sure-handed direction of Rich. It was really cool to hear my plays again with fresh ears, in front of a brand new audience. And I survived my first post-show talkback! The audience was engaged throughout, and had some really thoughtful and positive feedback for me. And I gotta say, the people of Minneapolis, in general, were sweet as all get-out. I hope to make a return visit soon to catch more theater in the Twin Cities…and work with MU again in the future too, of course! That’s all for now, folks! I’ll be sure to let you know when Ready, Aim…Fire! is up and ready to go. Until then, stay cool and enjoy your summer! It’s been an incredible year of having two of my new plays produced here in New York City, and now I’m off to see two of my older one-acts presented as staged readings in Minneapolis! As part of an Emerging Playwrights Exchange between Leviathan Lab and MU Performing Arts, Quarter Century Baby and Something Blue will be performed as part of MU’s New Eyes Festival of New Works. It’s the first time my plays will be performed outside of NYC and I couldn’t be more thrilled to be introduced to a new theater community! It will be exciting to share my work with a brand new audience and I’m eager to see how they’ll all respond to it – there will even be a talkback after the performances! Both plays were originally produced by Diverse City Theater Company in 2010, so it will be nice to hear these plays with fresh ears. Who knows, I may even be inspired to revisit these short plays and expand them into full-lengths! So if you happen to be in the Twin Cities area this weekend, come on down and check out the festival! There is a great roster of other plays being performed, and I feel pretty honored to be in such good company. I can hardly believe it’s already October! 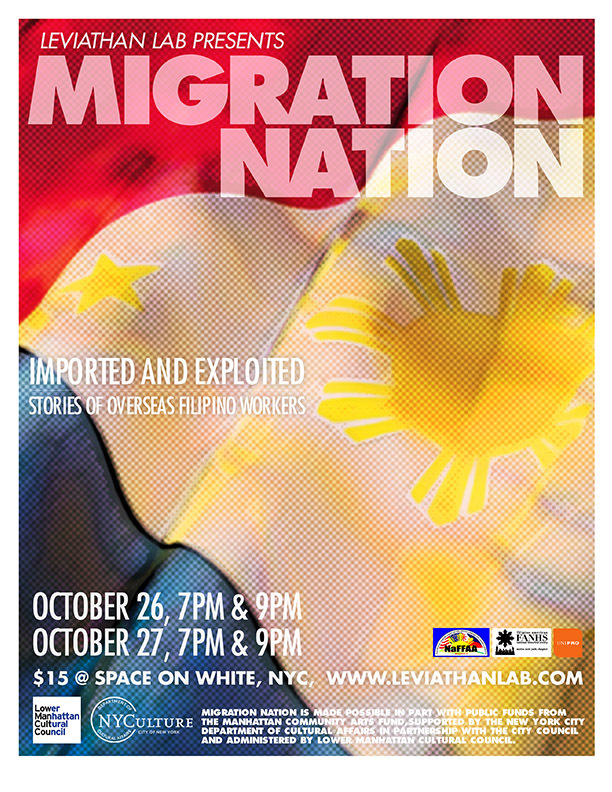 After a busy summer spent with my production of Lola Luning’s First Steps for the Women of Color Human Rights Theatre Project, I’m excited to cap off the year with a production of yet another short play of mine, Balikbayan Birthday, which will be included in Leviathan Lab’s Migration Nation. It’s a site-specific multimedia theatrical experience about Overseas Filipino Workers written by the members of our women writers group. And it’s our way of honoring Filipino American History Month. Please read more about it here. We only have four performances over two nights on Friday, October 26th and Saturday, October 27th, and tickets are extremely limited due to the space. So if you’re interested in attending, I urge you to buy your tickets now! And even if you’re unable to attend, please feel free to spread the word about the show, or consider making a small donation towards the production. We’re in the midst of our 40 Days to $4K campaign and we’re almost there! 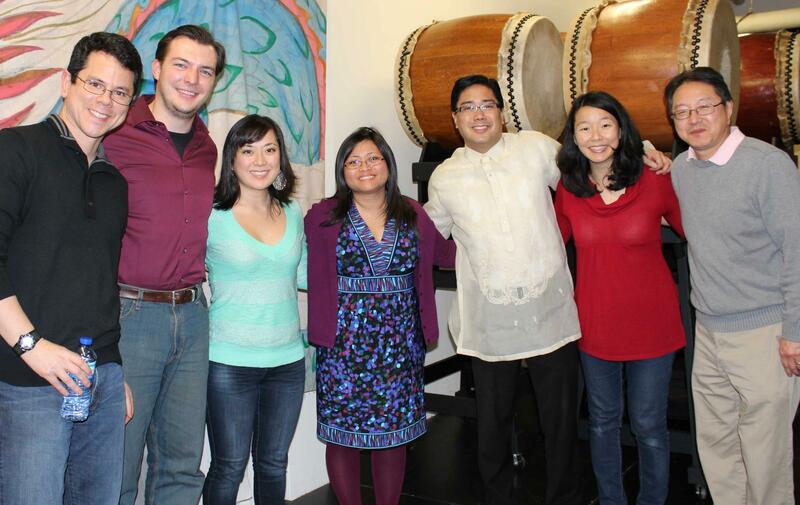 I hope you’ll come celebrate Filipino American History Month with me at Migration Nation! Mabuhay!